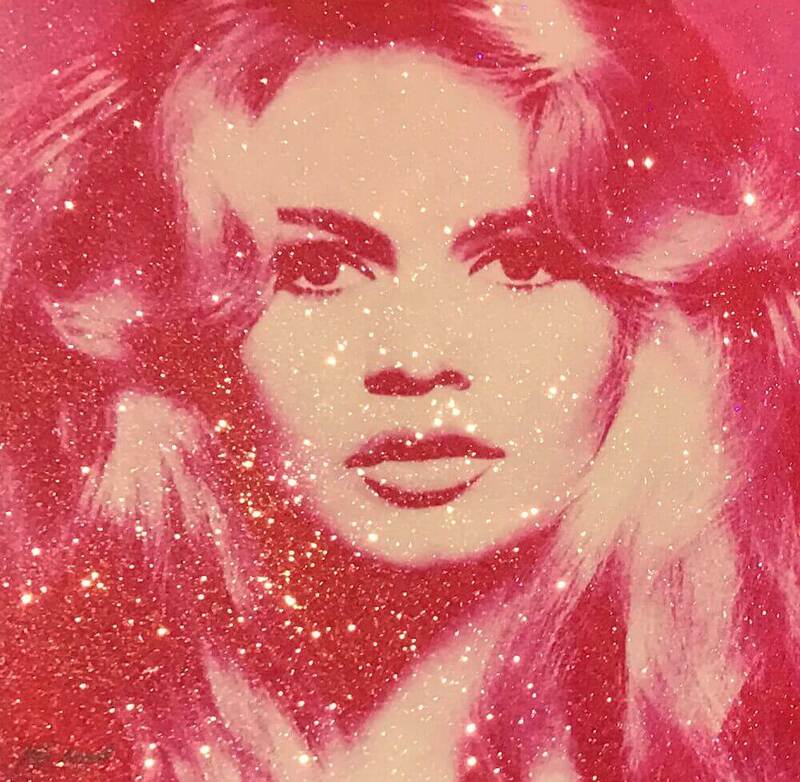 Acrylic and Silk Screen on Canvas, covered with Swarovski Crystal and Diamond Dust. Also available in 203x203 cm, 152x152 cm or any other size by request. ds. His pieces are hand painted or silkscreen on canvas and every crystal is placed by hand.In 2009, Moyal moved to Miami and established his studio in Wynwood where he also built his home. Moyal’s glittering portraits embody the materialization of the pop star, exploring themes of aesthetics, beauty, stature, and celebrity. His work presents his viewer with an up-close likeness of the world’s most famous celebrities, putting them face-to-face with the objects of their affection and admiration.Moyal established a successful career as a pop artist and developed a presence in Fine Art galleries worldwide. His works are collectible and highly valuable, with clientele including commissioned pieces for the Kardashians, Iggy Azalea, Paris Hilton, Gloria Estefan, Flo Rida, L’il Kim, Miami Housewives, Lea Black, reality-television star and entrepreneur Jonathan Cheban, Frankie Grande, tennis player Arantxa Sanchez Vicario, rapper Supapat, Israeli Idol singer Harel Skaat, Steinbrenner family owners of the Major League Baseball’s New York Yankees, the Tuohys (the famed family from “Blind Side”) as well as Formula One family – the Ecclestones.Moyal has also been involved actively with giving back to the community and dedicates his time and talent to organizations. He has collaborated with The Miami Children’s Hospital, Best Buddies, Sarcoma, Cancer Society, and continues to pursue other organizations.